The Nutcrackers circled the track as the emcee introduced them. When he called Badonkey Kong’s name, a woman behind me screamed, “That’s my sistah!” I snuck a look and saw that most of the people in the row behind us were wearing Nutcracker t-shirts. I hoped that wasn’t going to be a problem; I’d come to cheer for the Cosmonaughties. I didn’t even know that roller derby existed outside of Hollywood until a friend invited me to come see her co-worker skate, but I didn’t hesitate to say yes. The novelty of the adventure was enough to convince me to abandon my husband on a Saturday night, at least until the hour of our dinner reservation. Local roller derby teams belong to the Boston Derby Dames, “Boston’s first and only all-female, DIY, skater-owned-and-operated flat track roller derby league and proud members of the Women’s Flat Track Derby Association (WFTDA).” But this is not the big time by any definition. These women skate for love, not money, and they compete at the Shriners auditorium, which has seen better days (as have the Shriners we saw there). I was curious to see what a roller derby audience looked like. It turns out there’s nothing particularly remarkable about them. It was the kind of crowd you might see at the circus. Yes, there were some heavily tattooed and pierced folks that looked a tad intimidating to my aging suburban eye, but they were far outnumbered by under-stated, middle-aged lesbians and their children. Even the skaters looked, for the most part, like regular folk, albeit dressed in spandex and sporting knee-pads, elbow-pads, helmets and, I hope, mouth guards. Their names, however, were anything but normal. In roller derby, everyone has a nom de skate. We were cheering for Tiny Dancer, one of the tamer sobriquets. The other team had my favorite name, Maya Mangleyou. I liked the literary touch. Being brand new to the sport, it took us a while to understand what was going on, but after some coaching from our neighbors we were able to follow the action as Hayley Contagious and Crown Joules battled it out for the lead. It’s not a gentle game, there was plenty of pushing and shoving and skaters sometimes went down, but not for more than the few seconds it took to scramble back up. The Cosmonaughties took an early lead, but trailed the Nutcrackers midway through the second half. I can’t tell you who won because we left early to make our dinner reservation. I was sorry to miss the second half of the evening, a match between another Boston team and a team from Maine. The schedule shows that this season Boston will meet teams from all over, including Cincinnati, New York and Montreal. I may not have known anything about roller derby, but apparently lots of other people do. And although you can’t find the names the skaters were born with online, you can discover that many of them are smart, college-educated, athletic women with impressive day jobs. Now that I’ve experienced it live, I want to see what Hollywood has to say. I’m adding Whip It to my Netflix queue. 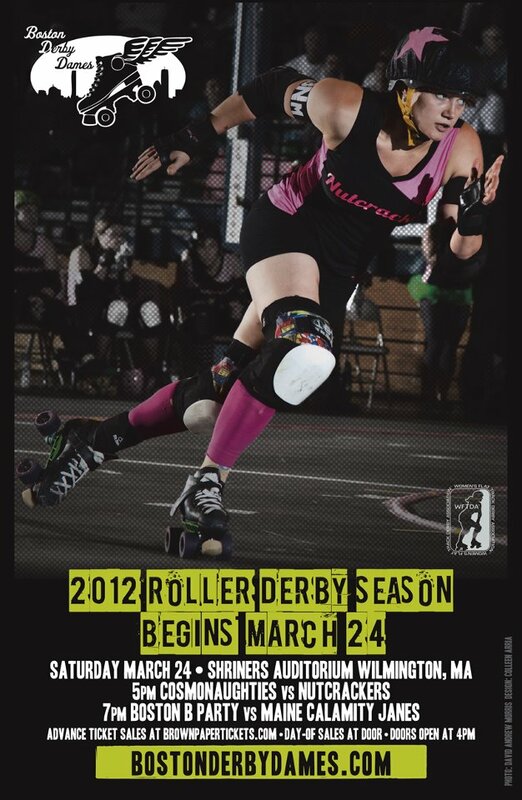 Then I’m going to put the next roller derby match on my calendar; Nutcrackers vs. Wicked Pissahs! Should be good. Anyone want to go? 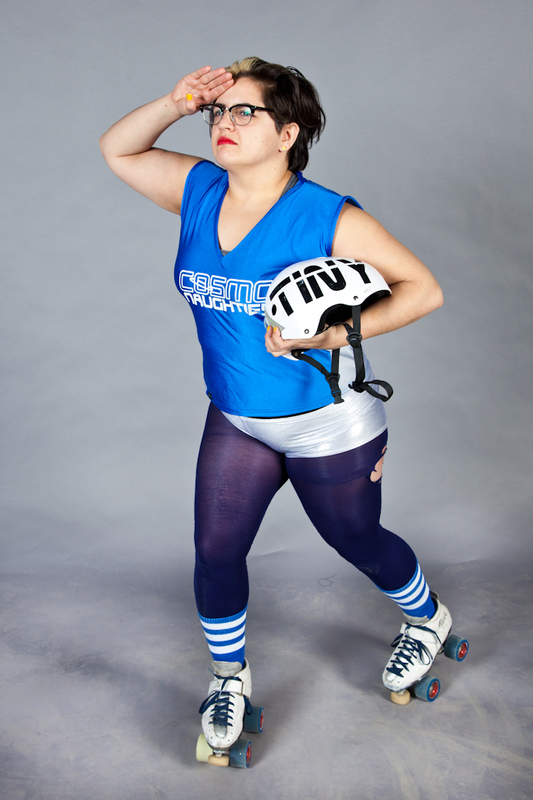 This entry was posted in Uncategorized and tagged Boston Derby Dames, novelty, Roller Derby. Bookmark the permalink. My favorite nom de skate is Erase-her head. Don’t forget Kansas City Bombers. Raquel Welch as a roller derby star! Wow, I did forget. I don’t know if I ever saw that. I’ll add it to Netflix. Thanks! My mother used to compete in roller derby with her twin when she was a teen. I’ve never seen it live. But after reading this, I sort of feel like I have. Tiny Dancer and Maya Angelou are cool names for teams.